Is There a Sustainable Business Model for Porter Airlines ? IPO, CSeries or WestJet in its Future ? Porter Airlines started in 2006 with two 70 seat Bombardier Q400 turboprops and is the brain child of one of Canada’s most famous and successful aviation entrepreneur, Mr. Robert Deluce, CEO and President of Porter Airlines. The Deluce family is one of Canada’s premier aviation entrepreneurs, with Mr. Stanley Deluce having started White River Air Service in 1951, and from that many new airlines were born, like NorOntair, Austin Airways, Air Creebec (still in business), Air Ontario, Air Manitoba, Air Alliance and Canada 3000 Airlines . In fact, I heard Porter Airlines was the idea of Robert’s son Michael as part of his MBA thesis, anyway its in the family. In fact, Air Ontario became part of Air Canada Jazz in 2002 and eventually Porter Airlines and Air Canada had a long running battle over Toronto Island Airport, now renamed Billy Bishop Airport (CYTZ) and the home to Porter Airlines and its 1,217 meter runway (08-26) and its fleet of 26 Q400’s today, with close to 1.8 million passengers travelling through the airport in 2013, serving 19 destinations in Canada and the USA. Porter Airlines competitive position lies in its dominant position at YTZ as it is close to downtown Toronto, and is very attractive and attracts a higher yields ($/RPM – revenue per passenger mile). For sometime, the fleet has been rather ‘stuck’ at 26 Q400’s as the competitive environment heats up between Air Canada and WestJet in Ontario and across Canada. The company tried to sell an IPO in 2010 but the timing was poor due to the global economic crisis and its negative impact on airline around the world. Revenue of $151 million, Operating Expenses of $155 million, Operating Income -$4.4 million, EBITDA $7.9 million, with Yield at $0.481/RPM, Load Factor of 47.9%, RASM of $0.231 and CASM of $0.238 while carrying 912,613 passengers with 18 aircraft and employing 847 employees, not bad for a 3 year old company. Of interest to me is CASM (cost per ASM) for the Q400 operation, more on that in a latter article, as I question the ‘economics’ of the Q400 versus ATR-72-600 or E175. In April 2013 Porter Airlines announced that it is ordering 12 107 seat (2 class seating) Bombardier CS100 airliners (list price today is $62 million each) so $744 million order plus options for 18 more, for a possible deal worth $1.86 billion, though with the CSeries program in a major crisis, and orders at only 201 (as of Feb 2014) it just is not selling well since starting the program in 2008. Such a large order for Porter Airlines in such a troubled program would quietly get a major discount of 25-35% very easily, as Bombardier is DESPERATE for new orders. The order book has in my opinion 76 orders that are highly questionable today with 2 new start-ups that do not yet exists (Odyssey Airlines x 10 CS100’s and SaudiGulf Airlines x 16 CS300) then there is Republic Airways (USA), which ordered 40 x CS300 when they owned Frontier Airlines, now that has been sold off and they cannot use them flying for major US airlines with 130 seat 2 class seating under current pilot scope clauses and Air Baltic (10 x CS100’s) of Latvia, bankrupt 2 years ago, and a highly questionable order as well, though a great job turning this company around by CEO Mr. Martin Gauss (ex-Malev CEO, ex-Cirrus CEO, ex-DBA Managing Director). 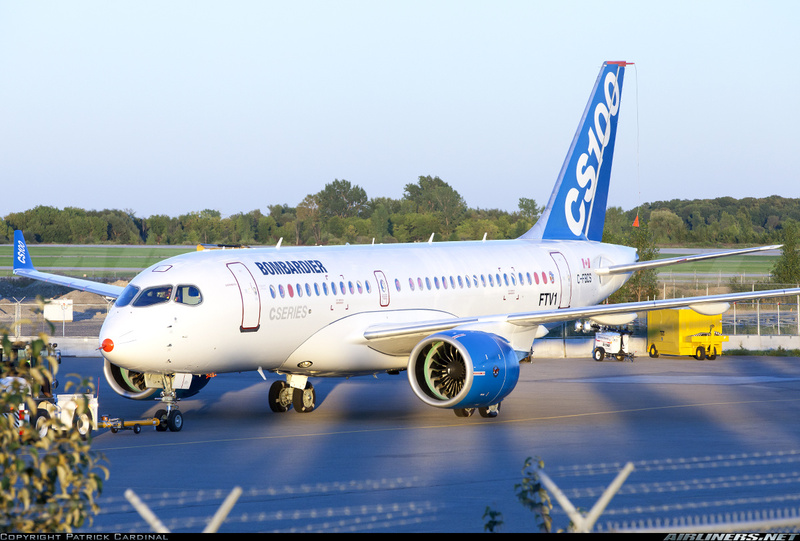 More on the CSeries another day, but in short Bombardier has been ‘check mated’ by Boeing and Airbus with their B737Max and A320NEO line at the top. In fact, Boeing has 1,922 orders to date for the B737MAX, but worrying is that the smallest model the 126 seat (2 class) Max7 has only 55 orders and Airbus has 2,523 orders for the A320NEO line and again the smallest of the line the 124 seat (2 class) A319NEO has only 39 orders ! In simple terms, the airlines are going for higher capacity aircraft, the 125+/- seat B737Max 7 and A319NEO represent 2.1% of the orders, yes only 94 ordered out of 4,445 orders ! that 125 seat segment is doomed. Embraer with its new modified E-Jet E2 models (E175-E2, E190-E2, E195-E2) with up to 118 seats (2 class) and with the same PW1000G family of high bypass geared turbofan engines as the CSeries, has an order book of 200 and it has only started selling/marketing them as of June 2013, so big trouble at Bombardier to come with this program that looks as it is targeted at the wrong segment and squeeze din by Airbus and Boeing from the top end and Embraer at the bottom end. Now, back to Porter. So Porter Airlines orders up to 30 CSeries aircraft for planned services from YTZ to Calgary, Vancouver, Los Angeles, orlando, Las Vegas, Edmonton, Winnipeg, Nassau, Miami, Tampa bay, Fort Myers and West Palm Beach, wow that is a huge expansion out of YTZ. Is this for real, in all due respect for Mr. Robert Deluce and his highly respected Canadian Chairman of the Board, Mr. Donald J. Carty the former CEO of Canadian Pacific Airlines and American Airlines, something is just not right about this. Look I was an Investment banker and I know you have to really hype up an IPO (Intial Public Offering), and I know Porter Aviation Holdings Inc. needs to do one since the 2010 IPO did not go through, but in my opinion this is a big PR exercise to hype up a possible IPO or an attempt to get noticed by Air Canada or WestJet to get them to buy Porter Airlines. Been done before, hats off to Max Ward and what he did with his Wardair Canada, taking a bush operation started in 1953 to a major international charter airline in 1986 with 4 x B747’s and 2 x DC-10’s to entering the Canadian scheduled market in 1987 and ordering 38 airliners in one shot ! (12 x A310’s, 12 x MD-80’s and 12 x Fokker F100’s), raising concerns from Canadian Airlines and Air Canada off course and such growth was not possible without major digestion problems, in the end only 12 x A310’s were delivered before Canadian Airlines bought Wardair Canada. I think Porter’s plan to get into jets is to firstly, to make the IPO much more attractive off course, wow 30 jets and 26 Q400 is a better selling line then just continuing as they do with 26 Q400’s., one it creates little excitement for the future, which investors MUST see as an IPO needs excitement about the future of the company raising the capital, and the CSeries jet and all those nice destinations that are planned for the future sound good. Secondly, BUT more a probable outcome is to get WestJet Airlines to buy Porter Airlines ! 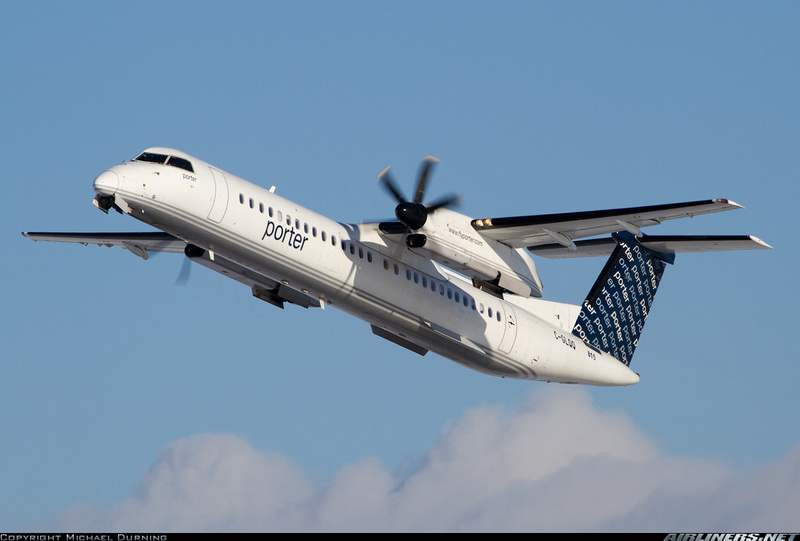 Look once Encore enters Ontario and Quebec every destination that Porter serves today will have Air Canada Express and Encore as competitors, usually with the same Q400 aircraft and yields will take a beating, consumer will win but not Porter Airlines in such a battle. Westjet needs its Encore Q400 operation up and running in the east as soon as possible, so that all the pieces are in place as it nears its plan to order long range wide body aircraft, probably the $288 million a piece,323 seat (3 class) Boeing 787-10 Dreamliner, I think this will come this year, but they need to have the feed in place in the East, so WJ is speeding up Q400 deliveries, but what better way then to get 26 Q400’s with pilots, F/S’s, engineers all at once, when you are in a hurry ? 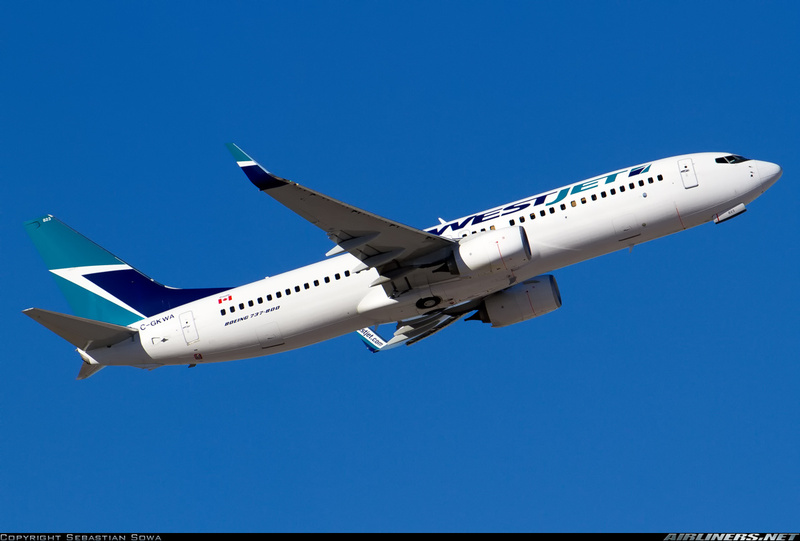 Once Westjet has its feed in place in the West and East, it is ready for the next stage, trans-Atlantic wide body services taking competition with AC to a new level. At this time, WestJet and Encore serve 31 destinations in Canada, 5 of them are NOT served by Air Canada (Brandon, Abbotsford, Hamilton, Kitchner and Comox). Air Canada serves 17 mainline destinations,all are served by WJ except Gander is NOT served by WestJet, while Air Canada Express serves 60 destinations, with a whopping 31 of those NOT served by WestJet at all, such as : Baie Comeau, Bathurst, Castlegar, Cranbrook, Deer Lake, Ft. St. John, Gaspe, Goose Bay, Iles de la Medeleine, Kingston, Lethbridge, Medicine Hat, Mont Joli, North Bay, Penticton, Prince Rupert, Red Deer, Rouyn-Noranda, Saguenay, Sandspit, Sarnia, Sault Ste. Marie, Sept-Iles, Smithers, St. John, Sudbury, Timmins, Toronto-City, Val D’Or, Wabush. This is the task for Encore, with 9 destinations in BC and Alberta not having WJ service but having AC service and then to the east you have a large market not yet served by WJ but only served by AC with 7 destinations in Ontario, 8 in Quebec, 3 in Newfoundland & Labrador and 3 in New Brunswick, and this has to be covered to get the feed coverage, before WJ starts its international wide body services, and here an acquisition of Porter by WestJet could be a possible choice. The wide body fleet would not be ready anyway very soon, deliveries are way out 2018+ but then there are the leasing companies that have secured valuable delivery slots for B787’s/A350’s. So we shall see if WJ goes for a slow Encore build up to the 45 Q400’s ordered and optioned or go for the quicker route through acquisition. The rumour some of Porter’s existing shareholders are lobbying for such a move, for it is hard to see how Porter will continue as is, as a YTZ strategy for the long term is limited by capacity at the airport, and once Encore is in Ontario and Quebec, competition on all of Porter’s Canadian route will be intense between Air Canada Express, Encore and Porter and the big looser will be Porter, the other two are mainly feeding the mainline jet services, while Porter’s will mostly be O&D traffic in and out of YTZ, though some connections are very good with Porter within its small network. The whole idea of regional aircraft feeding a hub is that you are bringing in passengers that will fly connect with your airline for onward travel be it Domestic or International. As and example, Sudbury to Toronto may have lots of O&D (origin and destination) traffic and be profitable, the real money for AC and WJ is to fly them to YYZ and then have some of those connect to your Winnipeg, Calgary, Vancouver, Dallas flights. Porter on the other hand does not have that kind of offering so it needs to make money on that route from the O&D traffic, a big disadvantage going up against Encore and Air Canada Express. Apparently, from reliable source Westjet has made an offer to Porter in 2013, but rejected, the CS100 order it to play it up some more, as a possible 3rd large Canadian airline entering the market. The problem here is that Porter needs to have the YTZ runway extended from its current 1,216 meters, now Bombardier quotes MTOW takeoff run for the CS100 at 1,463 metters, so we are looking at a minimum extension of 247 meters, which should not be such a big deal as the tunnel that is being completed connecting YTZ and downtown Toronto surely has generated a lot of unwanted dirt. In fact Porter is looking to extend the runway by 336 meters (168 meters), that will take runway 08-26 to 1,552 meters. The problem is that jets are banned at YTZ and it will take a great deal of lobbying to change that 1981 agreement between the city, federal government and the Toronto Port Authority (TPA) to protect local residents, the fight will be with Toronto City Hall, and Mr. Robert Deluce has in the past been a big contributor/supported to its City Hall’s infamous Mayor Mr. Rob Ford. The lengthening of the runway and getting approval for jet operations is only the beginning of several big problems for Porter. The next BIG problem is one overlooked by most, if you will have a fleet of 12 to 30 CS100’s and 26 Q400’s flying in and out of YTZ, the projection is that the airport needs to be big enough to handle 4+ million passengers per year (11,000 per day), which would place it in the top 10 airports in Canada, and they already have Pearson International, to more than double today’s capacity will cost a great deal of money, and who will pay for that ? roughly $500+ million and the disruption downtown, the increased traffic will not go down well with local residents. Then, if Jet approval is allowed, you will have other airlines wanting to fly jets in, as 1,552 ,meters is long enough for the Embaer 175/190 models, many used by US regionals, and how long will TAP (Toronto Airport Authority) be able to keep AC from adding more flights and WJ from adding flights. It cannot allocate 85% of the slots to one airline for too long without having to allow more competition into YTZ either voluntarily or by some court order. Lastly, $1.8 billion in aircraft from Bombardier is a big bill, ok with discounts $1.2 billion, but still a big step to finance and then having to have a war chest to compete on all those destinations where they will compete with flights from Pearson (YYZ) to all of those destinations not with just AC and WJ but American, United, Delta and others, will a 107 seat CS100 be able to compete with B737-Max8, A320NEO not likely, its not a market the CS100 is designed to compete on, CASM will be in favor of the higher capacity new generation aircraft for sure. It is no secret that WestJet has some interest in YTZ, but has been low key about it, CEO Gregg Saretsky has been quoted by the Globe to say “We would like to have the opportunity to fly jets ourselves from that airport”. IF direct competition with AC and WJ is on for Porter, then the institutional investors have to be worried about their investment. Oh don’t get me wrong I am not against Porter Airlines, I want Mr. Robert Deluce to succeed, but the reality unfolding in front of him is a difficult one. The man has built an airline that is carrying around 2.6 million passengers per year and by my estimate has to have revenues around $500+ million in 2013, and I wish him much success, if anyone can do it it is Robert Deluce. If I were a betting man, my bet would be on WestJet Airlines acquiring Porter Airlines within the next 12 months, with the delay in the Cseries certification by 1 year at least, you might be looking at 2017 at best, and with delays in getting the Toronto City Hall approval for extension of the runway and allowing jets into YTZ, the time frame for a successful implementation of the whole thing becomes a long shot. Within a year Encore will have a bigger presence in Ontario and Quebec and Porter will find its yields eroding along with AC and WJ as competition intensifies all around Ontario and WestJet and will the CSeries arrive in time to change the game plan ? Certification will be much more difficult for the CSeries than Bombardier planned, just look at the problems Boeing has had with the B787 Dreamliner years behind schedule and Airbus is years behind with its A350 as well, and they are the big OEM’s Bombardier has just been stretching the Challenger 600 business jet into a 50 seater (CRJ-200), 74 seater (CRJ-700), 86 seater (CRJ-900) and 104 (CR-1000), but now has to develop and entire new airplane, with new engines and new technology, and mark my words, more delays will follow, which Porter and Bombradier need. This year will be a very interesting year either way for Porter Airlines and it will be interesting what the future holds for the niche airline, a wonderful brand that everyone in this industry and noticed and respects very much.